All 10 seeds up and running, , just have to keep them alive now, (that's the hard part). 3 of the 4 Tumbling Tom seeds through. Next stop pricking out hopefully. 4th and final seedling through although one doesn't look too happy - something's been nibbling its leaves. 3/4 sun gold, 4/4 tumbling tom and at least one chilli of each, Apache, Scotch Bonnet and Havana Gold. Thought I'd cooked them in the hot press as it was very warm in there, but moved to windowsill where they started getting leggy. I then knocked up this growbox with a £15 LED light off ebay and they seem to be doing ok now. Should be interesting to see how they get on using just artificial light. They are in an unheated loft conversion and with the lid down the temp seems to max out at 25c which seems about right to me. Itchy fingers. Sowed a few "Jersey Sunrise" heritage tomatoes. Fairly soon, as I think we are fast approaching 'normal' sowing time - would you agree? Right then - please don't post any more seed sowings. This what I used for my chillies several years ago, I found the light did a great job to a point, I discovered there wasnt enough light once the plant got to a certain point and they became leggy. 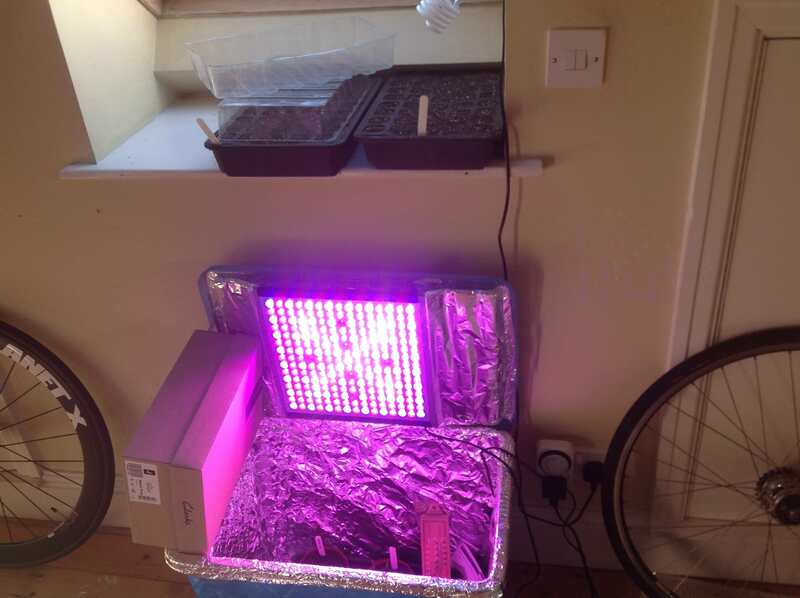 I still use this light for germination/ seedling stage but now have a 300watt LEDgrow light to grow them on further, I also discovered I was in fact giving them too much light, the dark period is from the research I did more important as it is this stage that the plants convert t the chemicals they need to grow etc, its my favourite word of all tme... Photoperiodism! So my chillies now have 12 hours a day as this is their norm from their native countries, I discovered many tricks and tips from some indoor funny herb web sites that helped a lot. <snip> I discovered many tricks and tips from some indoor funny herb web sites that helped a lot. There's some really good tips on some of those! Have you tried 'Fiming' your chillies? Anyway, back on topic.....4 red tumbling toms potted on into individual 3" pots. 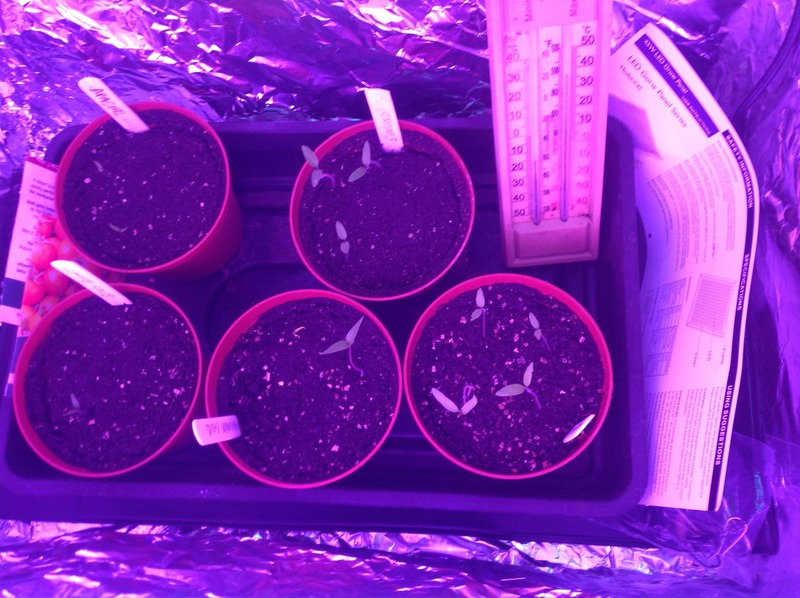 Not filmed but here is a weekly photo diary of the first efforts with the chillies and a tom under the grow lights as Nobbie's..
Not filmed, fimed (no L) ...similar to topping but designed to produce more branching. I tried it last year with a Lemon Drop and Dedo de Mocha - both plants produced a lot more fruits than their 'topped' and 'just let to get on with it' brothers! Current state of play with some of the Shirleys and Scotland Yellow. Probably not as far on as some. No heated propagators or grow lights here. Only artificial aids were a polythene bag and some foil. Page created in 0.335 seconds with 52 queries.